Dr. Chris LoRang (left) with of Joe Gatto, Davis Sanders and Phil Hodgin of RDG Planning & Design. Des Moines, Iowa – On February 2, 2017, Capital Chiropractic & Rehabilitation Center was named Business of the Year by the Des Moines East and South Chamber of Commerce. The title is shared in a tie with local firm RDG Planning and Design. 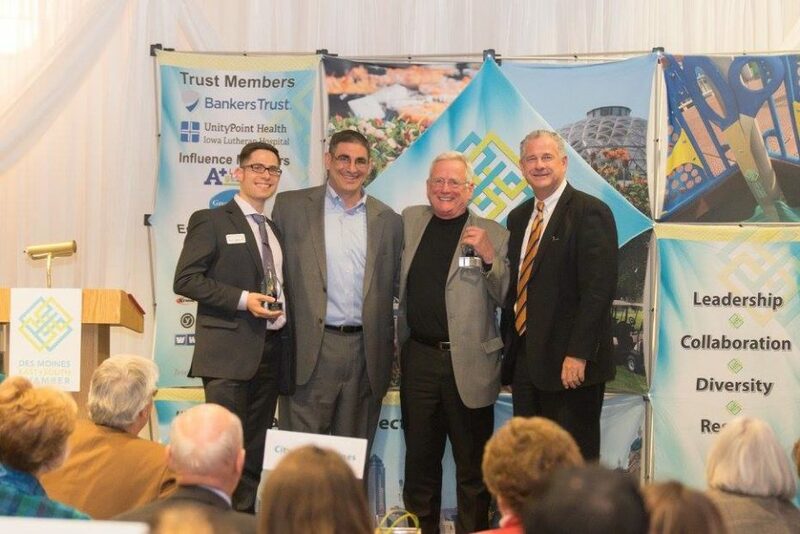 The award was announced at the Des Moines East and South Chamber’s Annual Celebration held on Thursday, February 2 at Baratta’s at Forte in Downtown Des Moines. The evening is meant to “recognize outstanding contributions of citizens, teachers and business leaders,” according to the Chamber. Capital Chiropractic & Rehabilitation Center is an award-winning sports and family wellness clinic located in Des Moines’ East Village. For more information, visit the Capital Chiropractic website at CapitalChiroDSM.com or contact the clinic at 515-421-4018 or office@capitalchirodsm.com.